I joined @moonmountainman's 4th Annual Winter Tribe Meetup in Washington this year. 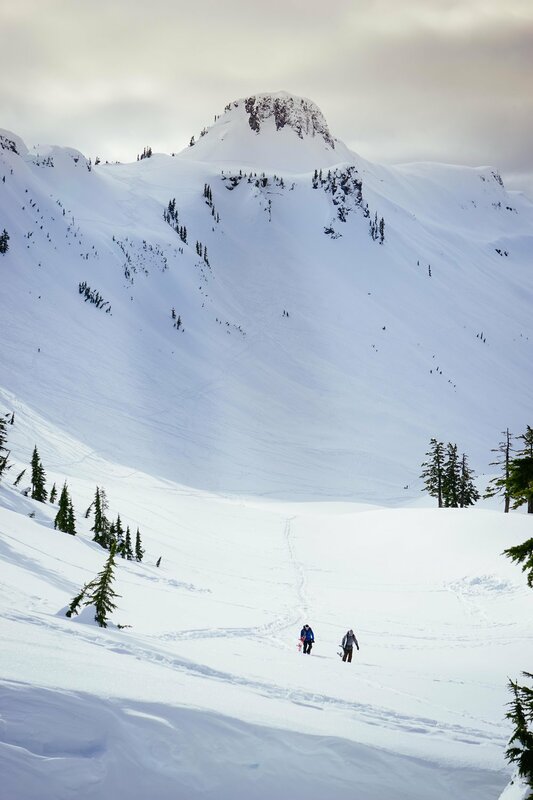 The plan: Snowshoe in Mount Baker National Forest and build snow caves! The result: My favorite days of 2019 so far! I arrived at camp after snowshoeing through landscapes familiar to me from fall hikes but buried in snow. The trail was busy with snowboarders going off jumps and tons of cross-country skiers enjoying the bluebird day. I knew I arrived at the right place due to the tent setup matching the meetup photo, but there was no one in sight. All I could distinguish were spews of snow getting lodged out of several holes that were deep enough for the people digging to not be visible. I hesitated as I put my backpack down, excited and anxious to meet Jacob Moon, a familiar face via Instagram that I would describe as authentically adventurous. He posts Instagram stories and photos that help me convince my friends to try alpine climbing, mountaineering, and packrafting. However, I was pleased to find that he brought energy and enthusiasm to every situation, question, and conversation, which is 100% the vibe he gives off on social media. Being one of 5 people to take his offer to go a day early to get a head start on building the caves felt like I won the lottery. It was an intimate gathering compared to the next day where 60 people were anticipated to join us. After an introduction to building snow caves and 4+ hours shoveling snow, an Irish guy and I built our version of Rome in a day. Our cave had a staircase that led to a tunnel in the mountain that opened into a beautiful cave made for two. We cooked dinner in Jacob's cave that night and chatted about adventures and misadventures, which make equally great stories. When we were all full and tired, we all left in a race through the freezing night to our own cave. Sleeping in a snow cave was better and warmer than I could imagine. Every time I woke up in the middle of the night (in typical backpacking fashion), I reminded myself I was in a snow cave and fell back asleep smiling. The next day, 30+ people joined in on the fun and I was reminded how easy it is to connect immediately and strongly with people when you do the things you love. After two incredible nights, leaving was bittersweet. My smile coming down the mountain was what you'd expect after having 10 cups of coffee: a little insane and scary, but a display of the real happiness that warms you from the inside out. The memory of sitting in the snow pit with Jacob, his wife, Natasha, their daughter, Zoey, and 10 people who were fast-friends is imprinted in my mind as a reminder of how exciting life should be. It gets cold the second you stop moving so having extra layers to throw on is necessary. I hike with a light merino wool base layer, a windproof layer, and a light vest on top (however, a base layer and light puffy jacket work too) plus a base layer and cross-country ski pants on the bottom. At camp I add a warmer puffy, a fleece, and fleece-lined gloves (on top of liner gloves). I don't bring additional layers for bottoms, but I would if I had Feathered Friends down pants. They pack down with your sleeping bag unlike typical snow pants and are ideal for early morning and night photography! I am guilty of not wanting to get out of clothes I wore during the day that, at the time, feel warm and impossible to change out of. However, the moisture on the clothes remains even if you can't feel it and getting cold from the moisture at night will be unavoidable. The layer closest to your skin needs to be fresh and dry, used only for sleeping. Also, drying out wet and frozen gloves and socks is usually out of the question, so bring a new pair for each day. The best way to warm up before bed is to eat a warm, dense meal. More calories mean more energy to help your body produce warmth. Plus, fats are the most useful macronutrient for warmth so bring a little container of olive oil or nut butter packets. To make sure you will be able to cook a meal, keep your lighter warm in your pocket, bring matches just in case, keep your gas canister warm in your sleeping bag, and bring a full gas canister meant for all seasons. The most challenging part of winter camping is staying warm while sleeping. If you can count the number of times you wake up on one hand, you are doing well! To avoid waking up from being cold, take a look at your sleeping bag and sleeping pad ratings. A -7-degree Celsius bag is my minimum and to make the bag warmer, I use a liner which adds up to 10 degrees Celsius of warmth (fleece options are also great) or use two sleeping bags. Even more important than a sleeping bag is your sleeping pad, which is your insulation from cold surfaces. The R-value of your pad will tell you it’s ability to resist heat flow. Since a sleeping pad will never cause you to overheat, you can go up to an 11 R-value and not be worried about summer backpacking. The minimum for winter camping is 4 R-value. If your gear doesn’t make the cut, it is easy to rent gear for your trip so you have an enjoyable experience. I enjoyed meeting amazing people, sharing stories, and connecting over our shared experience. I appreciate that Jacob Moon makes time to put on an event like this and I will cross my fingers that I'll be able to make the next one!